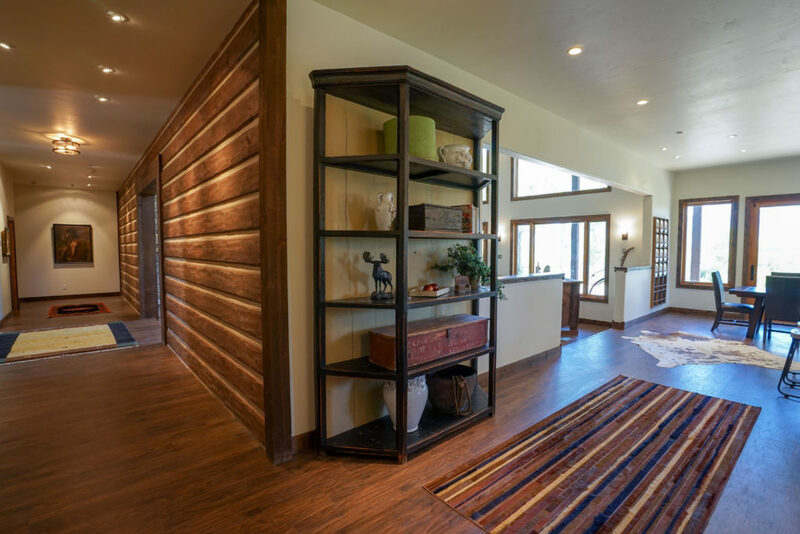 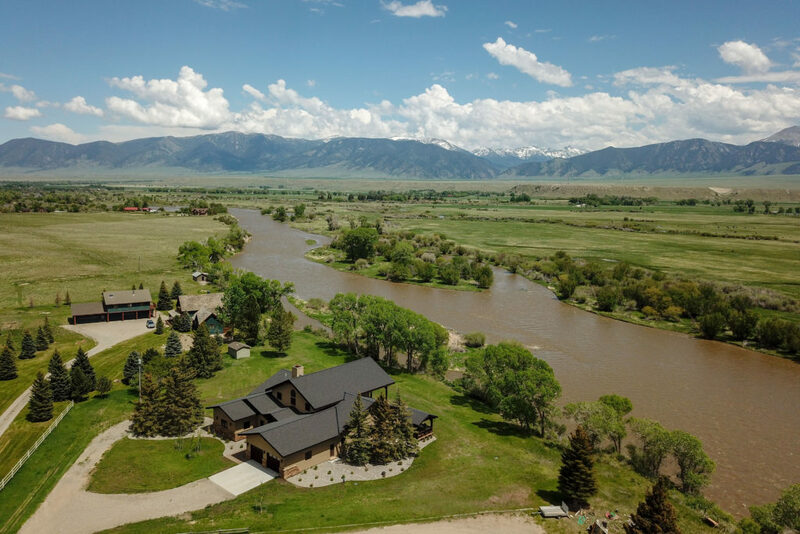 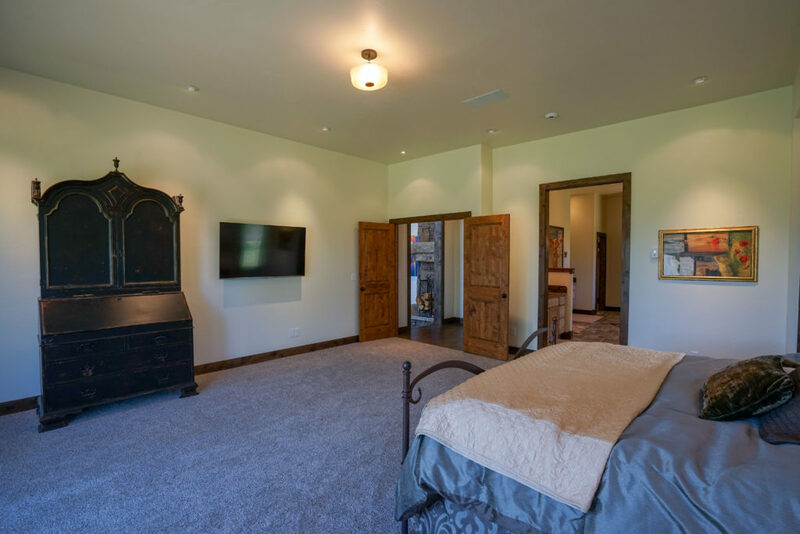 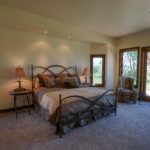 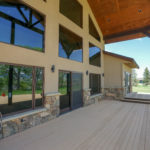 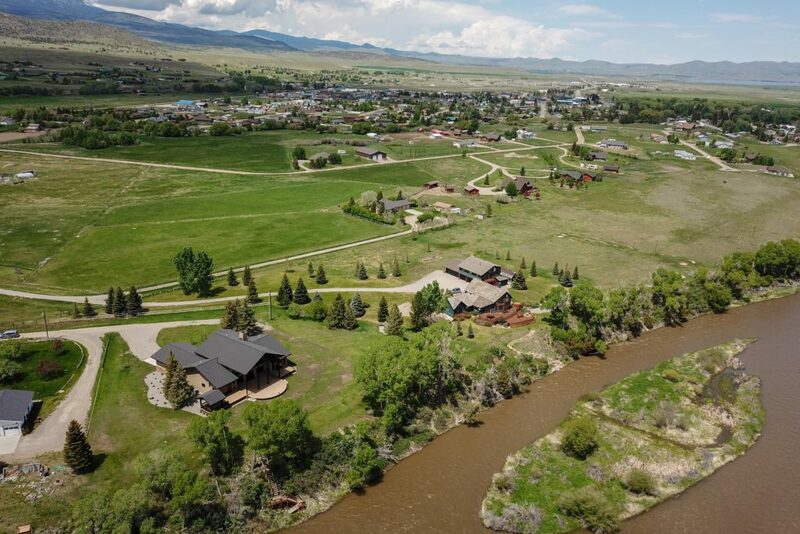 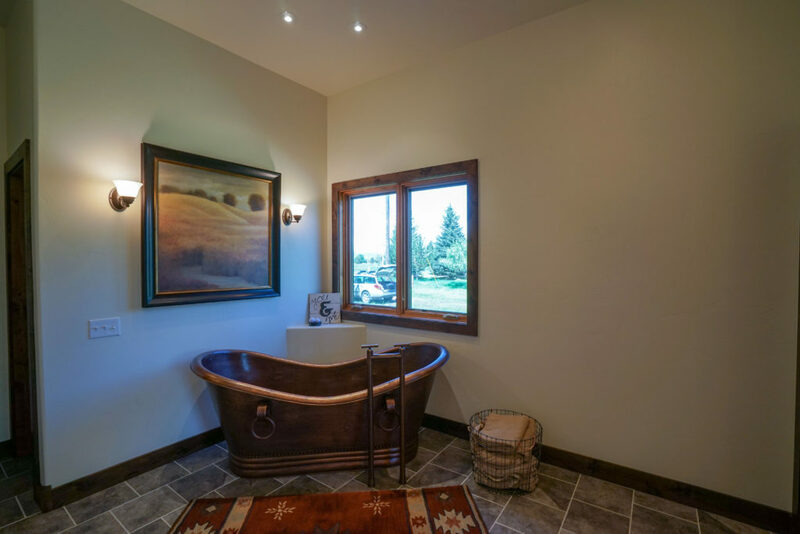 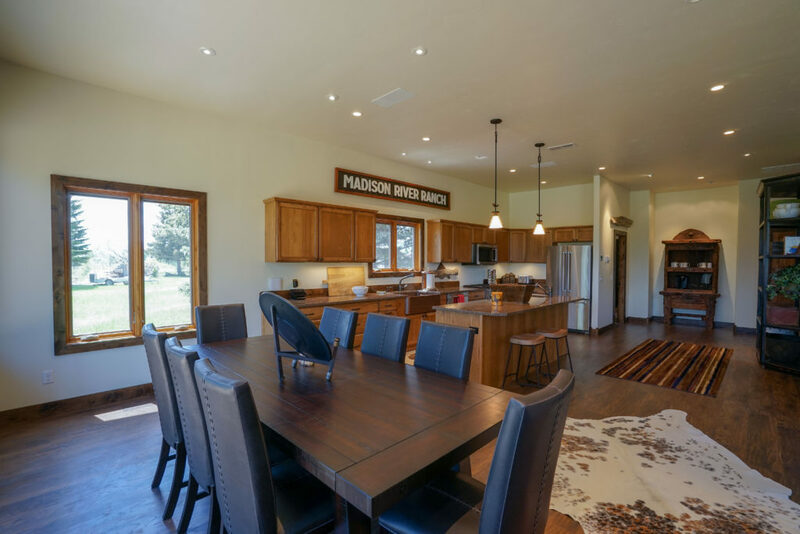 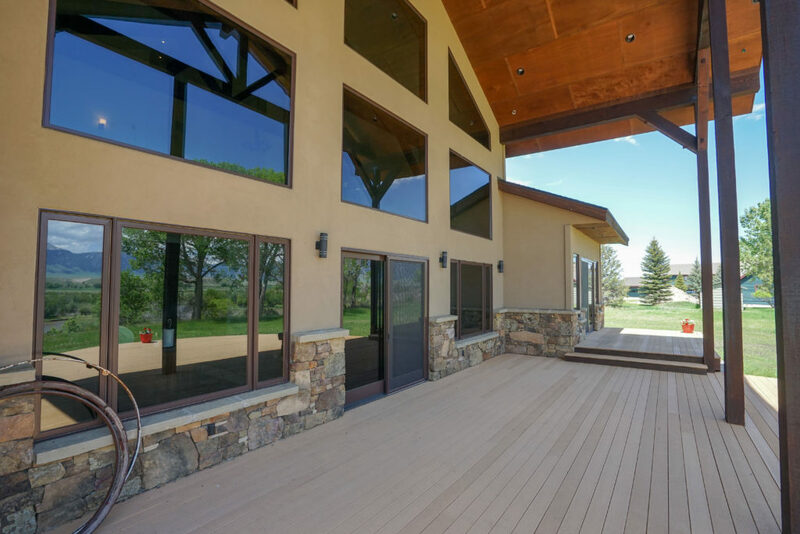 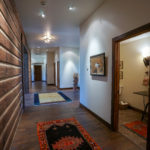 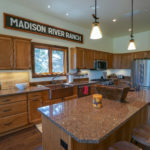 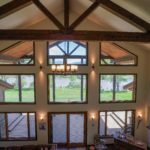 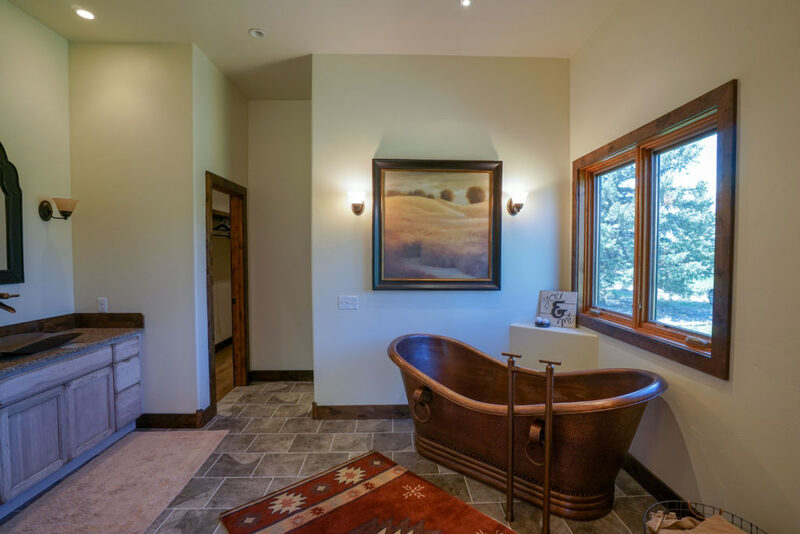 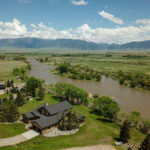 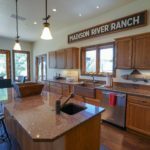 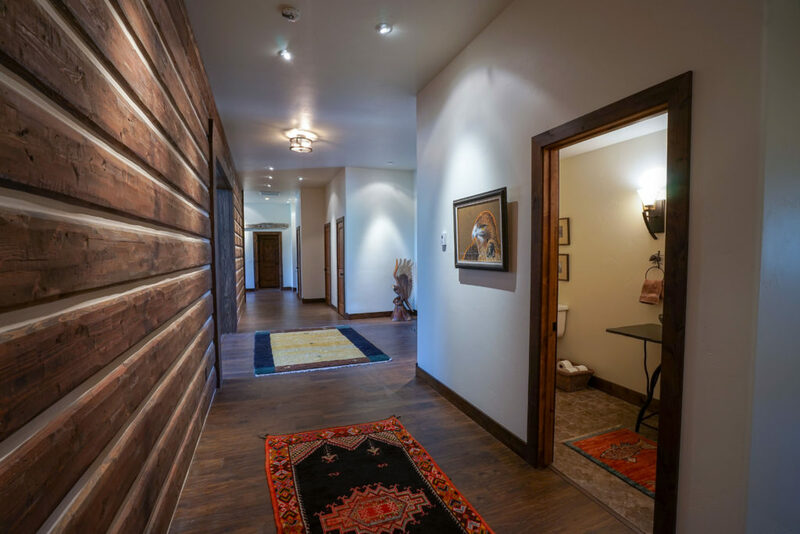 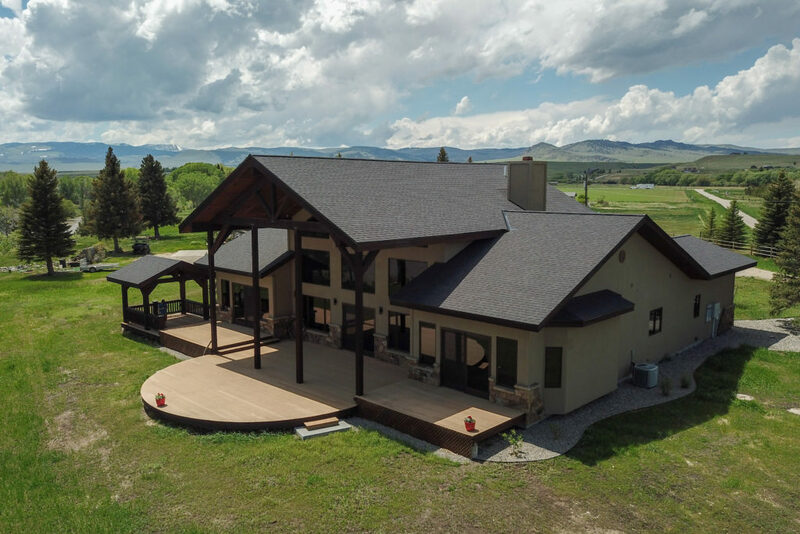 Madison River Ranch is a luxurious home located on the Madison River, only minutes from downtown Ennis, Montana. 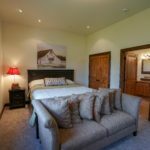 It is well suited for families and fishermen and comfortably sleeps 9 in 4 bedrooms and an additional 2 in a guest office. 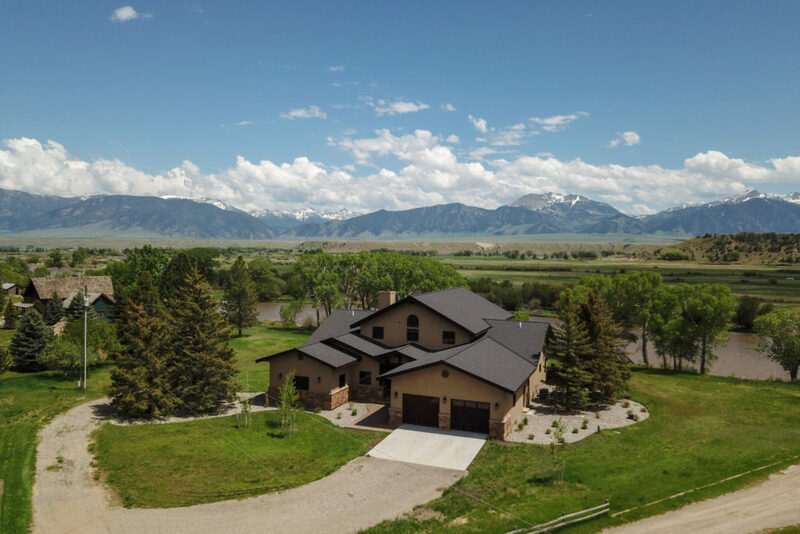 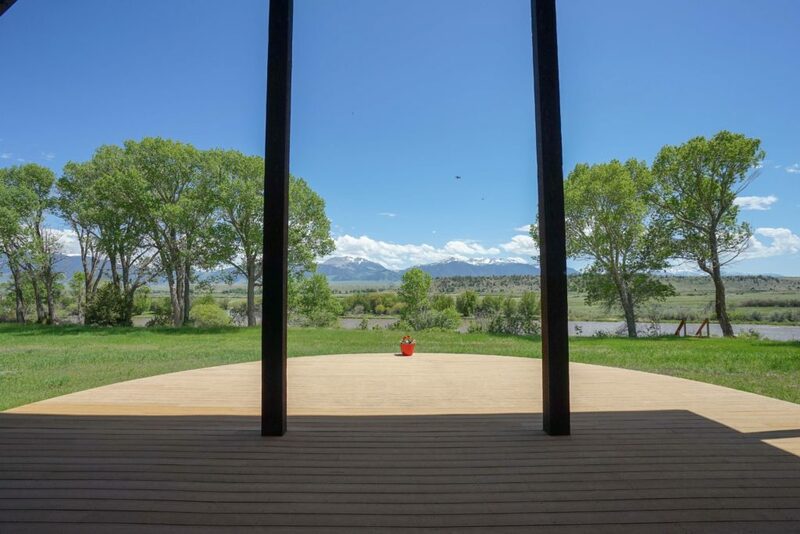 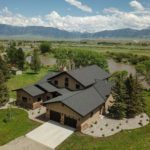 The end of the road location provides wonderful privacy and stunning views of the Madison Range and River Valley. 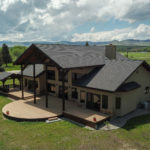 Located 1 mile south of Ennis, and 73 miles from West Yellowstone and the West entrance to Yellowstone National Park. 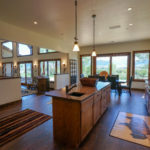 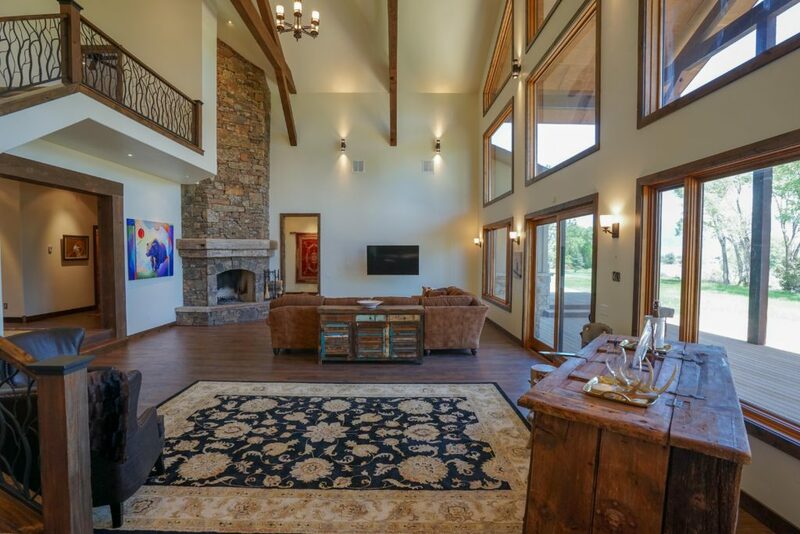 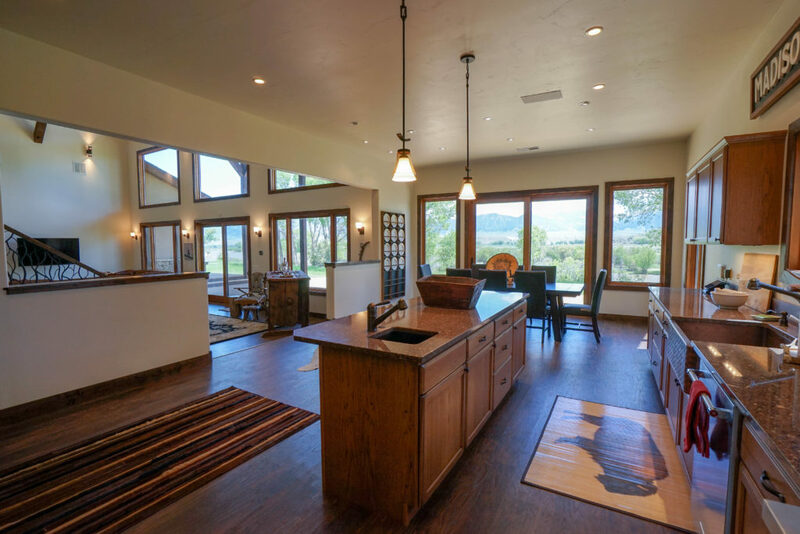 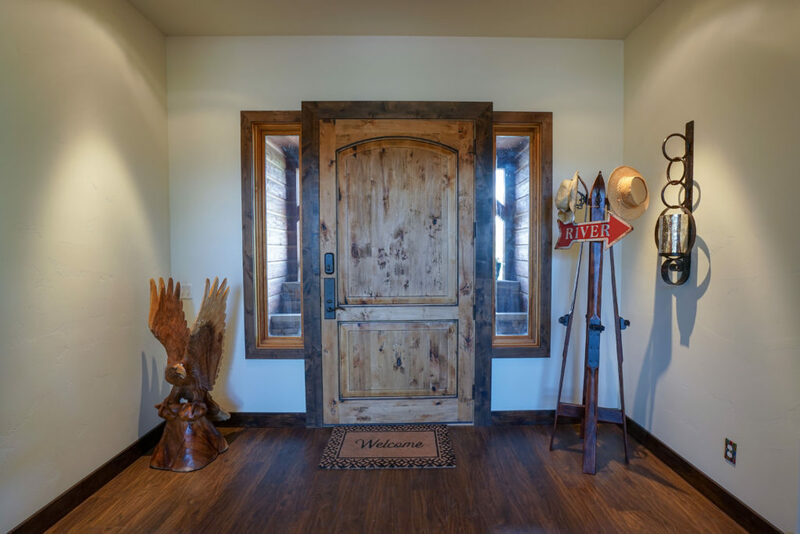 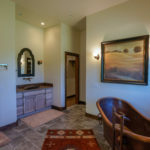 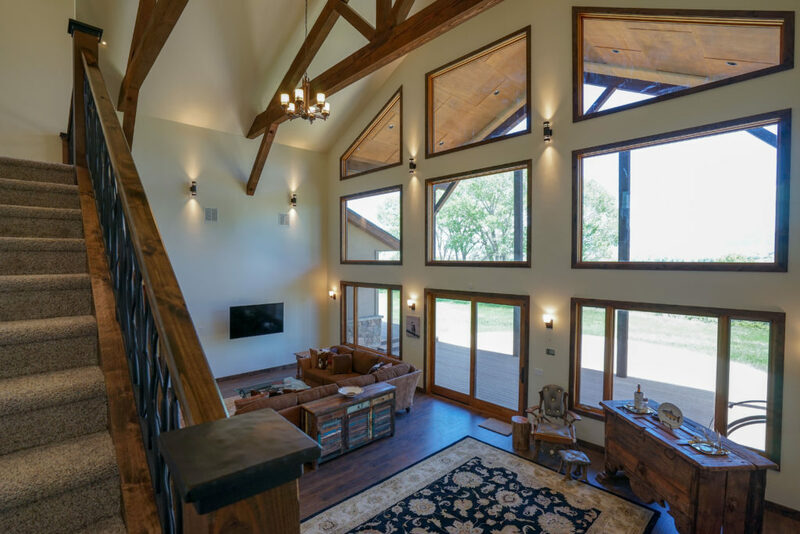 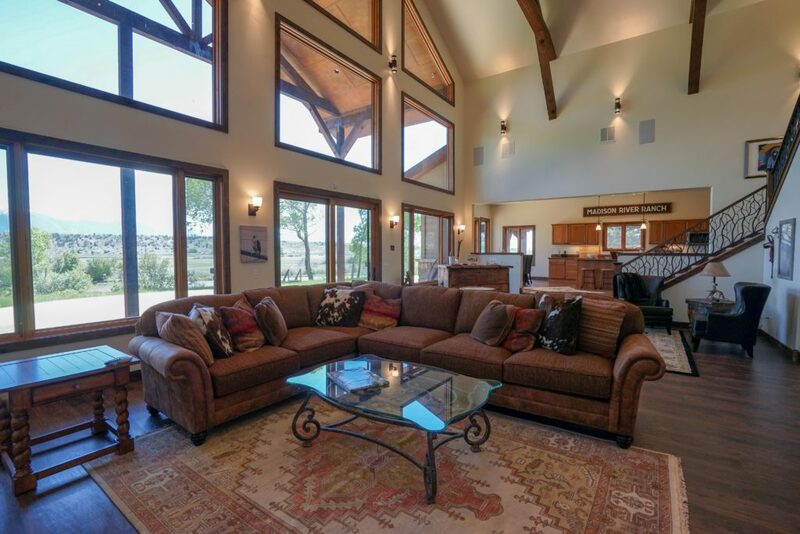 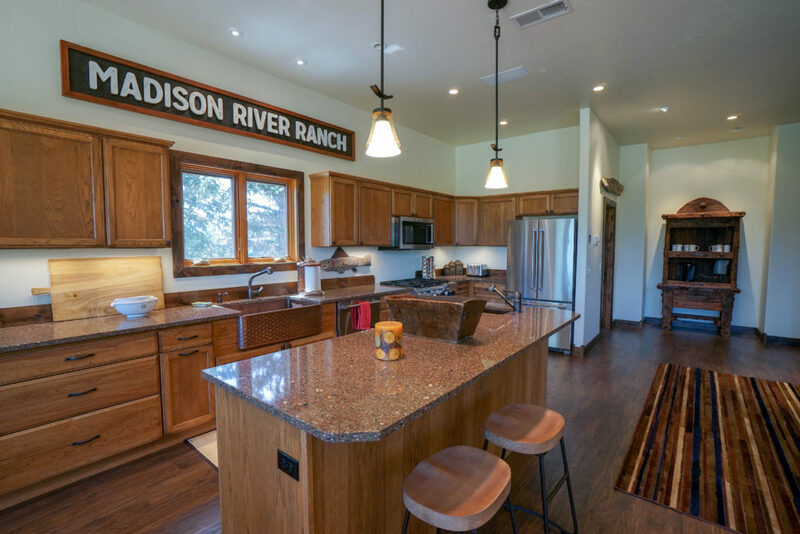 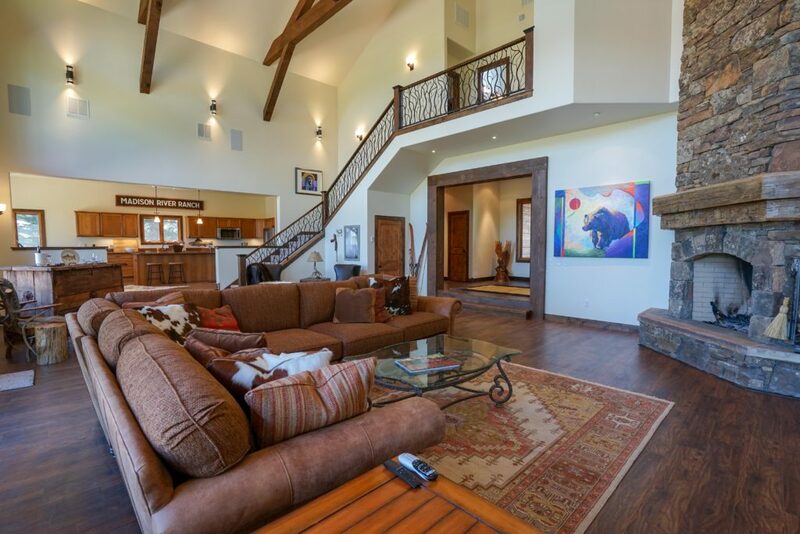 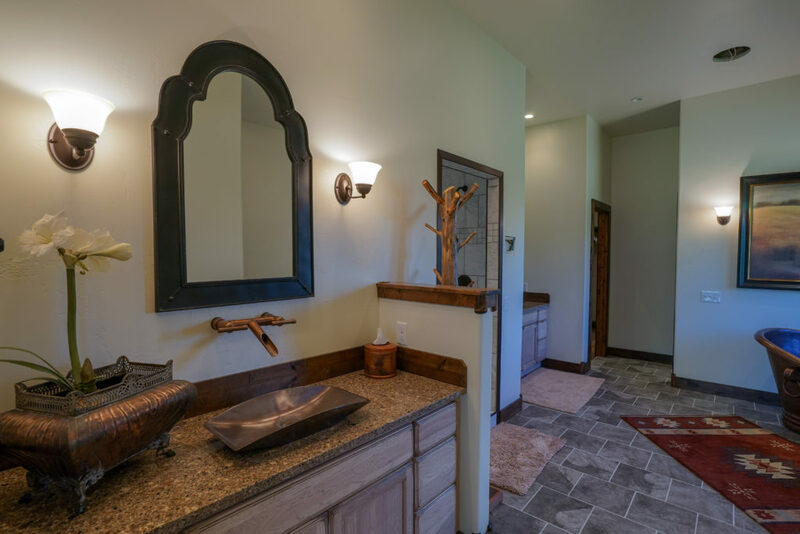 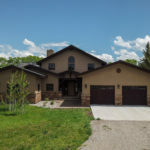 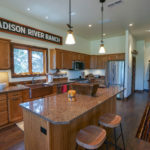 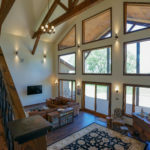 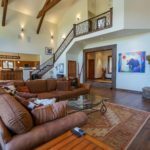 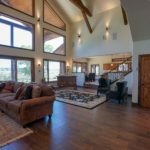 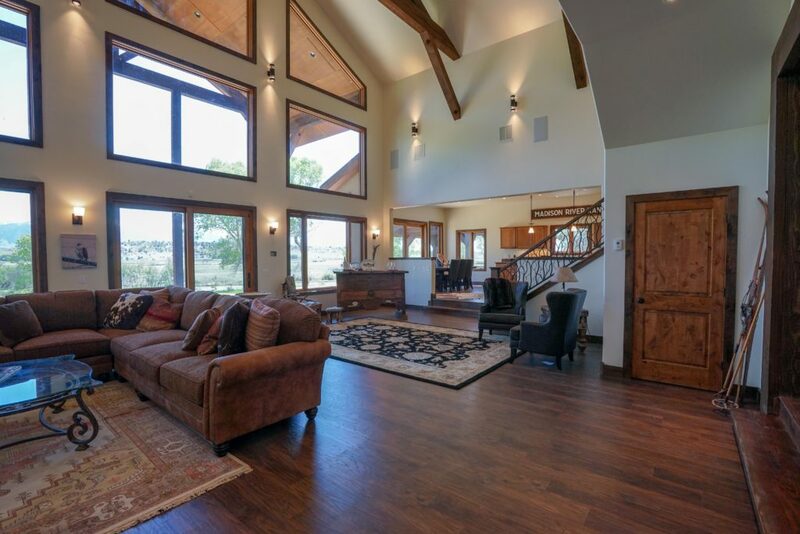 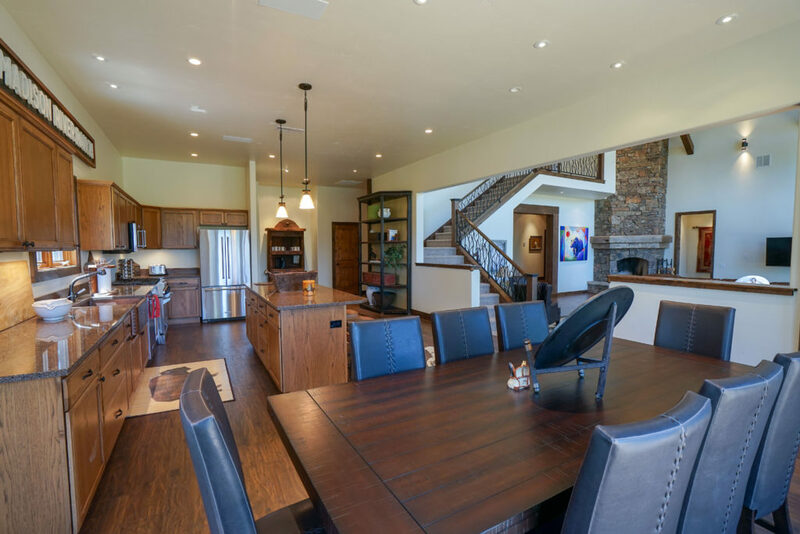 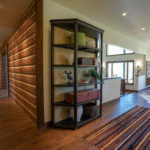 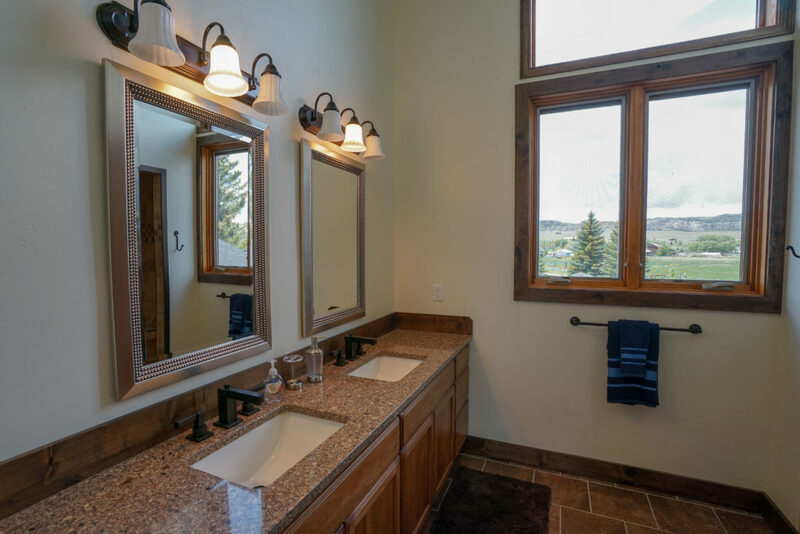 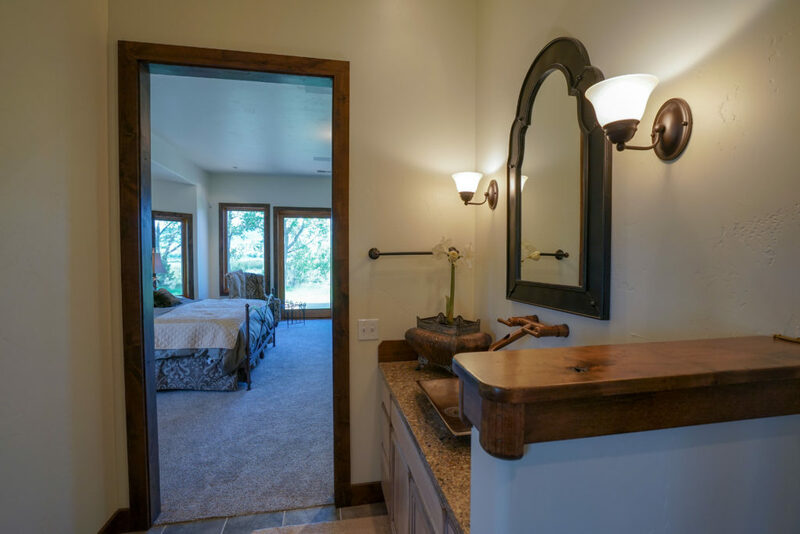 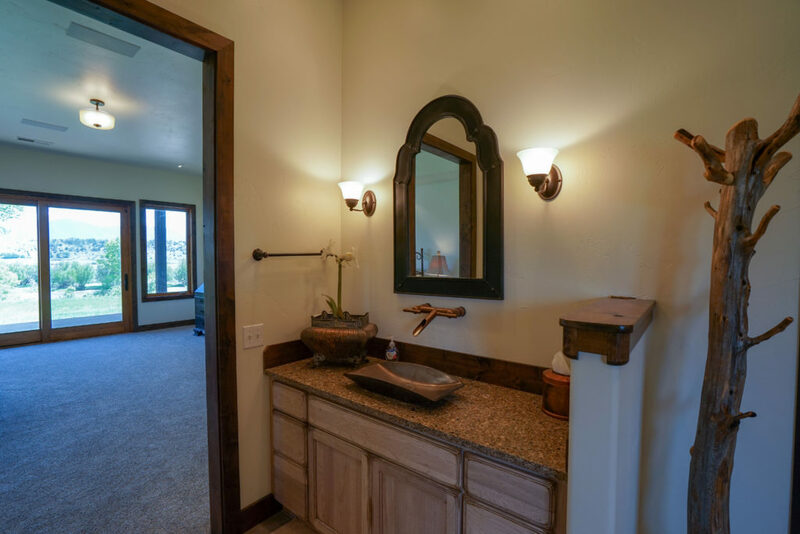 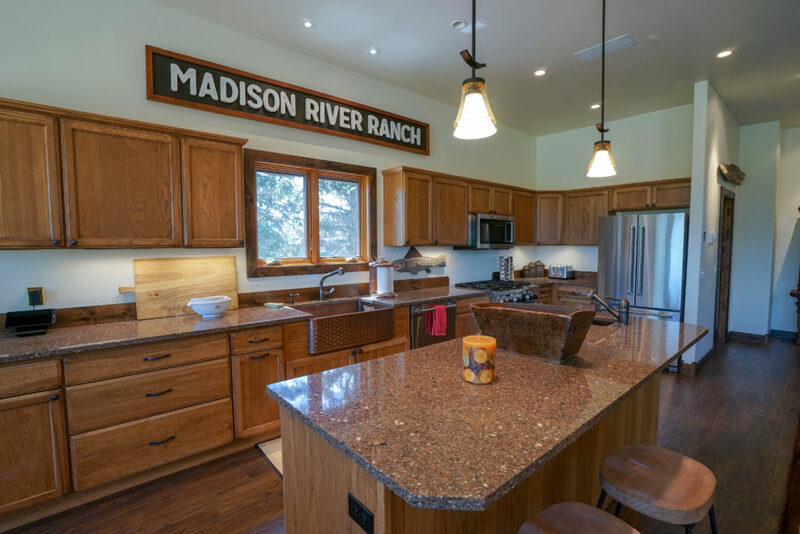 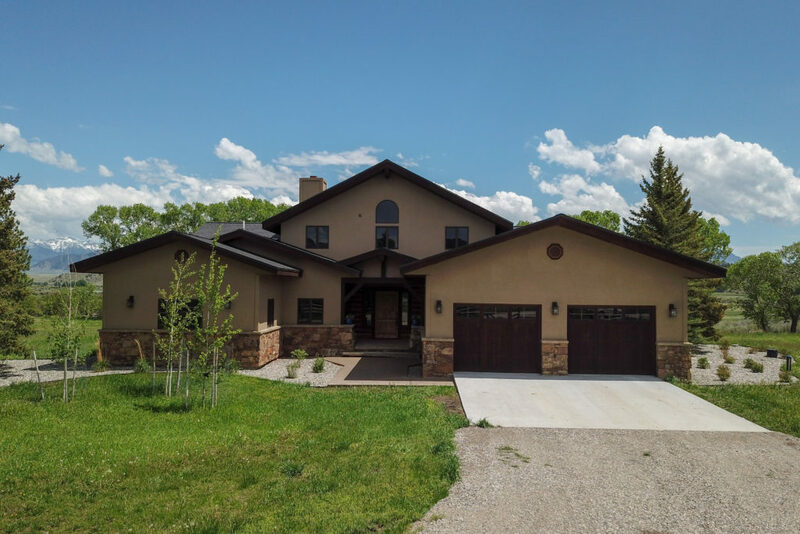 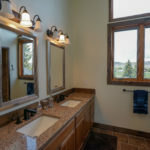 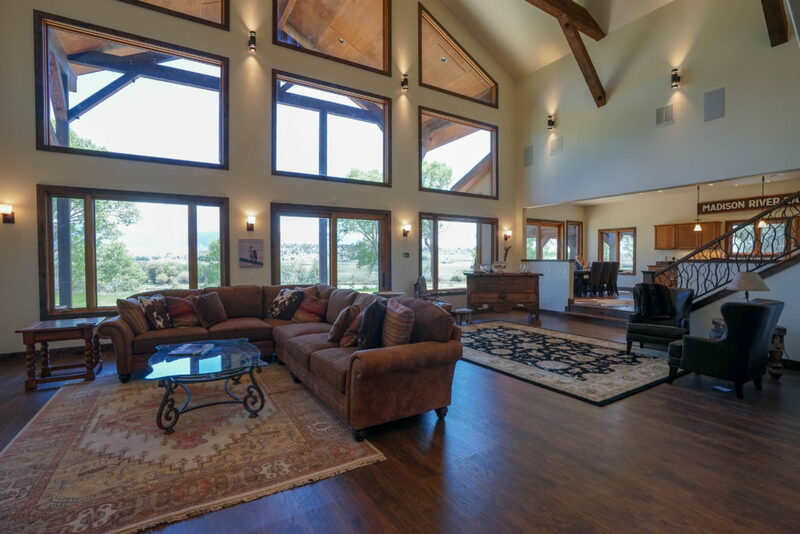 Madison River Ranch has 4 bedroom and three and a half bathrooms. 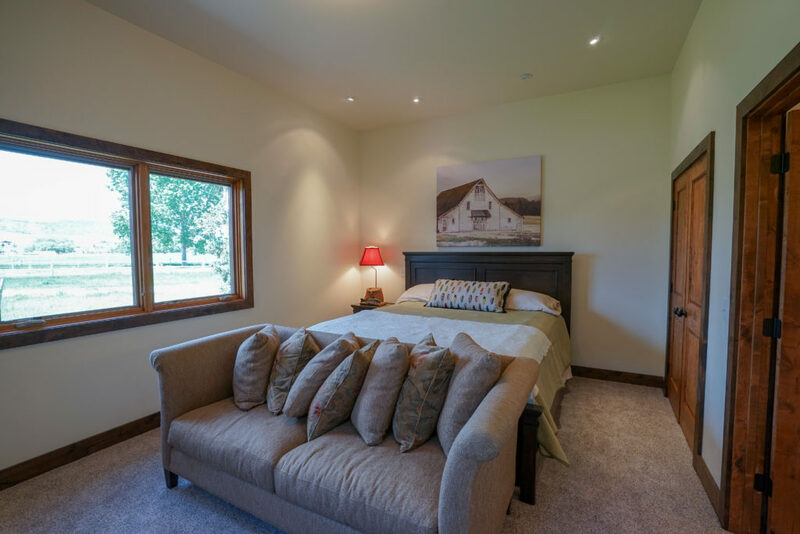 There are two main floor master bedrooms. 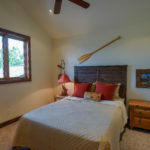 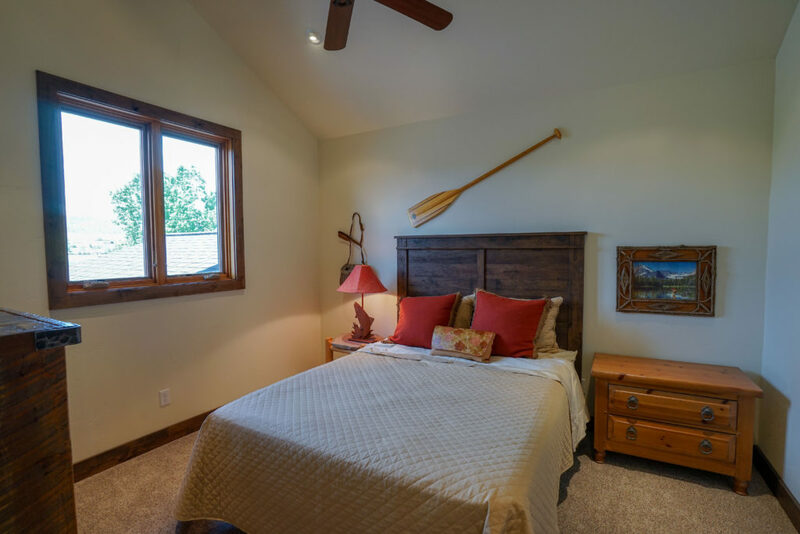 The first has a queen size bed and full bath with a soaking tub and private access to the deck and river. 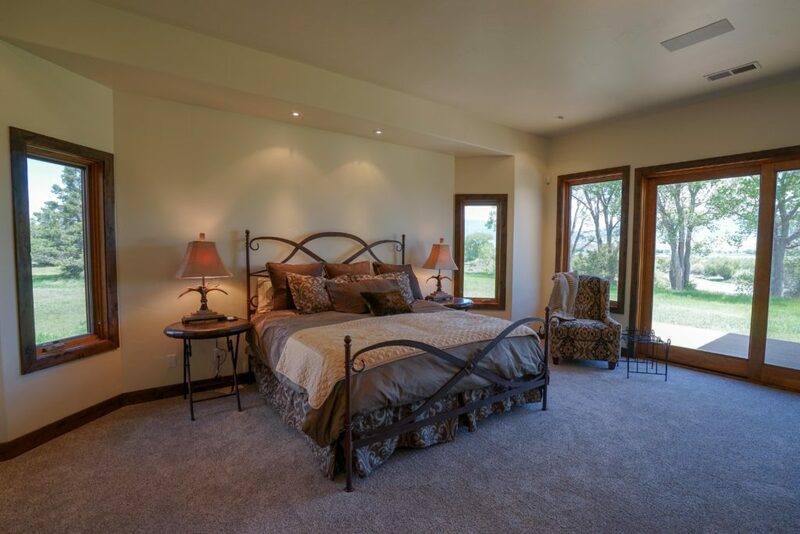 The second has a queen size bed with a 3/4 bath and walk in shower. 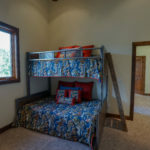 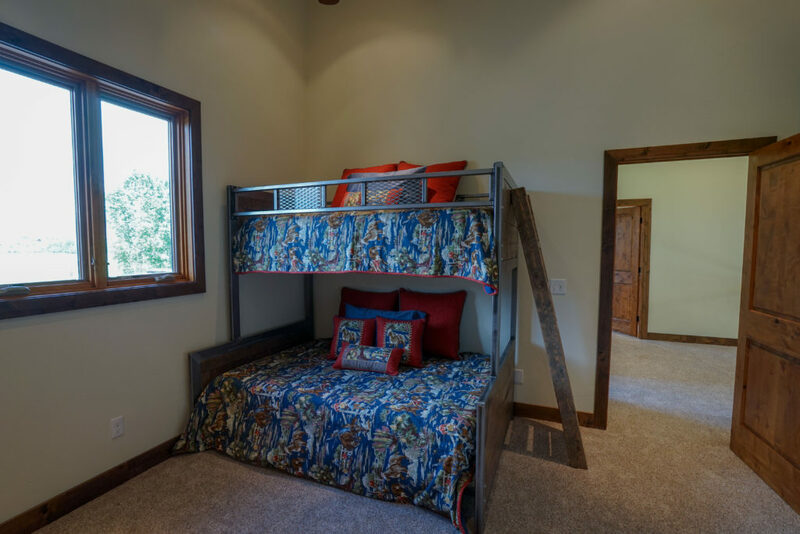 The upstairs has two bedrooms, one with a full size bed and one with a full on the bottom and twin on the upper bunk. 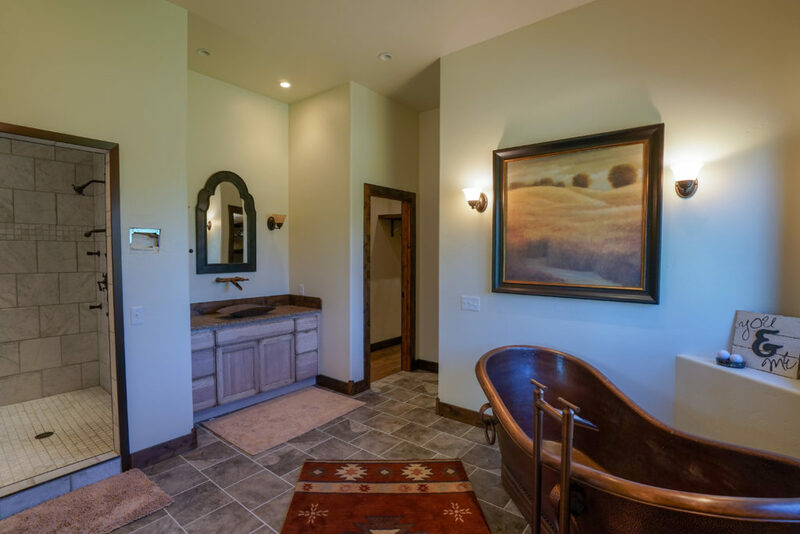 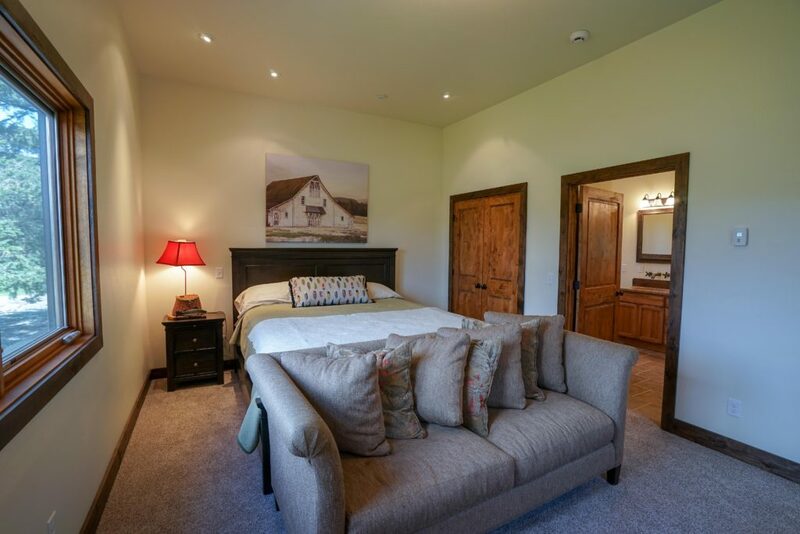 The upstairs shares a full bath and has a stunning balcony view of the river. 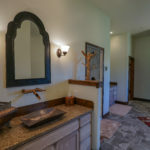 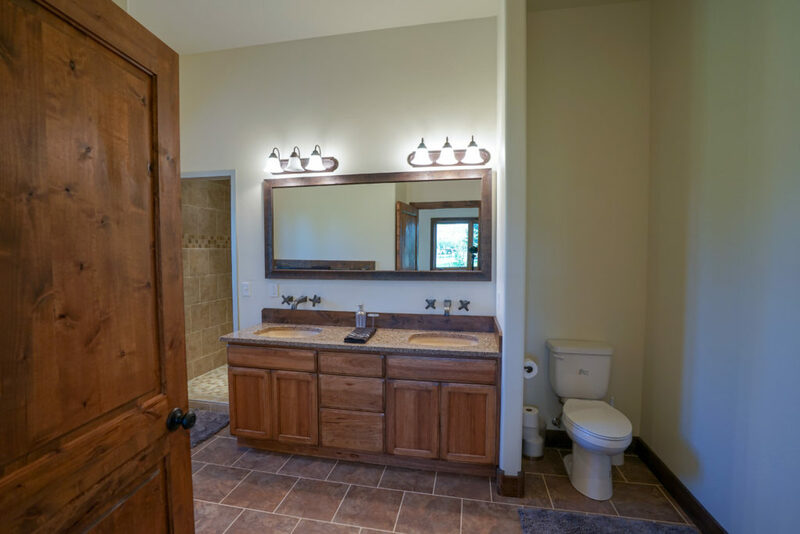 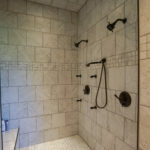 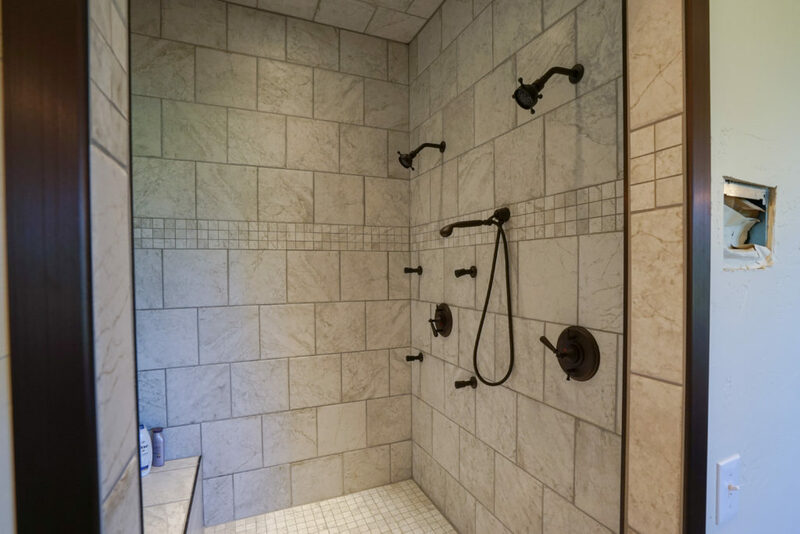 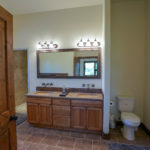 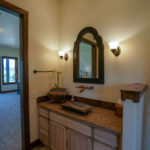 There is an additional half bath near the front entry. 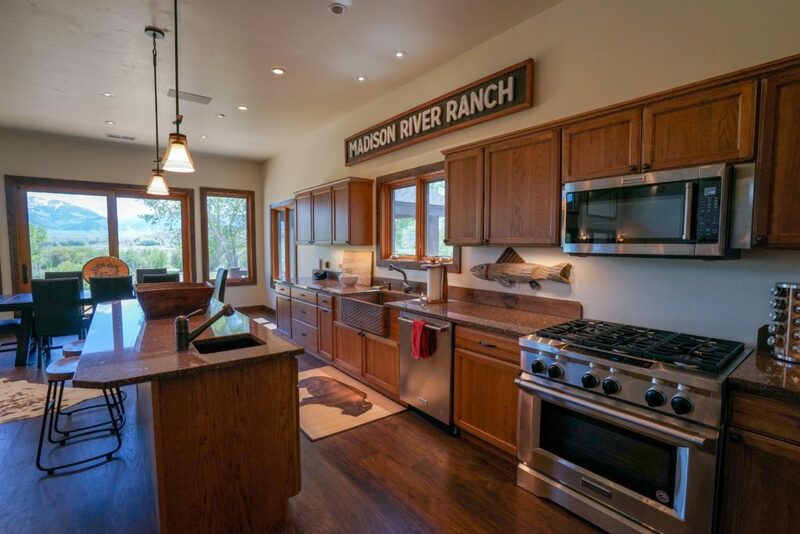 The kitchen is fully equipped with state of the art appliances and everything a cook would need. 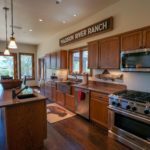 There is a gas range and oven, large refrigerator, toaster, microwave, dishwasher, island with seating for two and a separate coffee bar including a Keurig coffee maker. 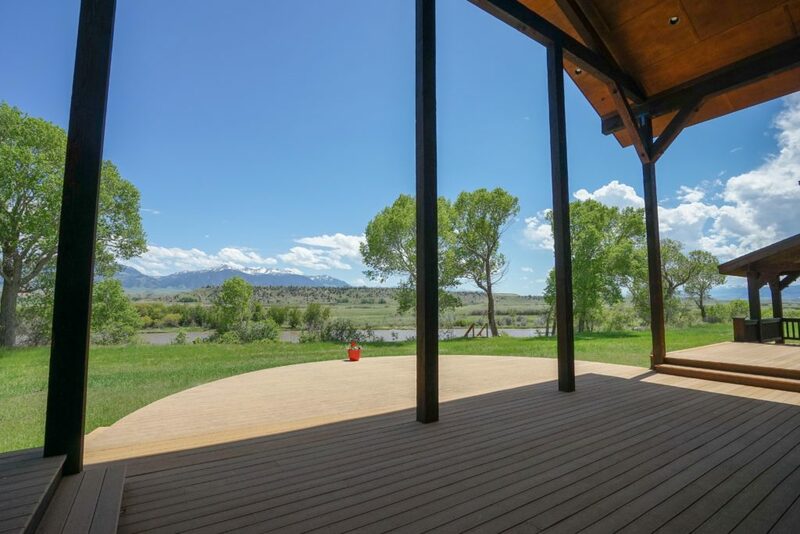 There is seating for 8 at the dining room table and outside seating in the gazebo and on the deck as well. 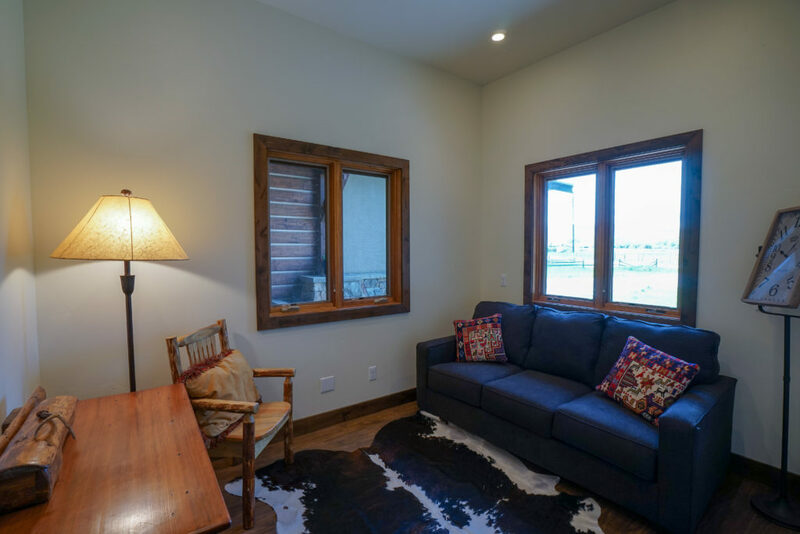 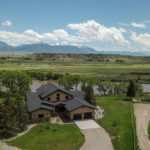 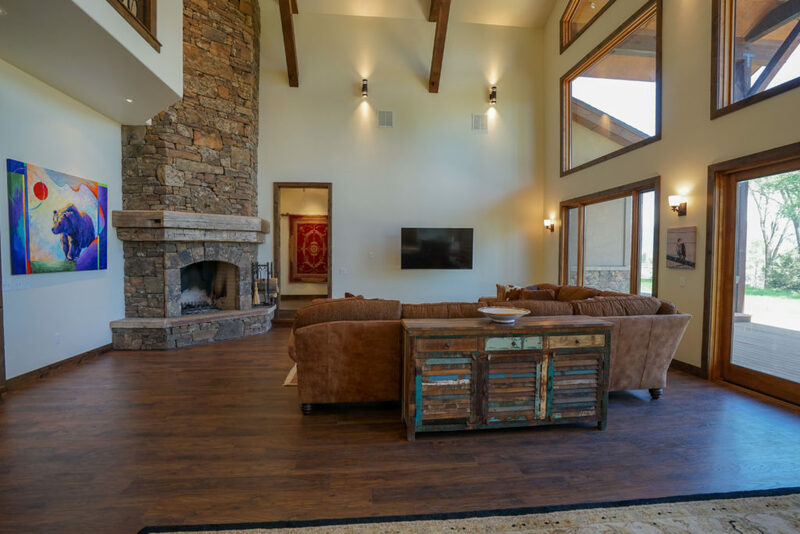 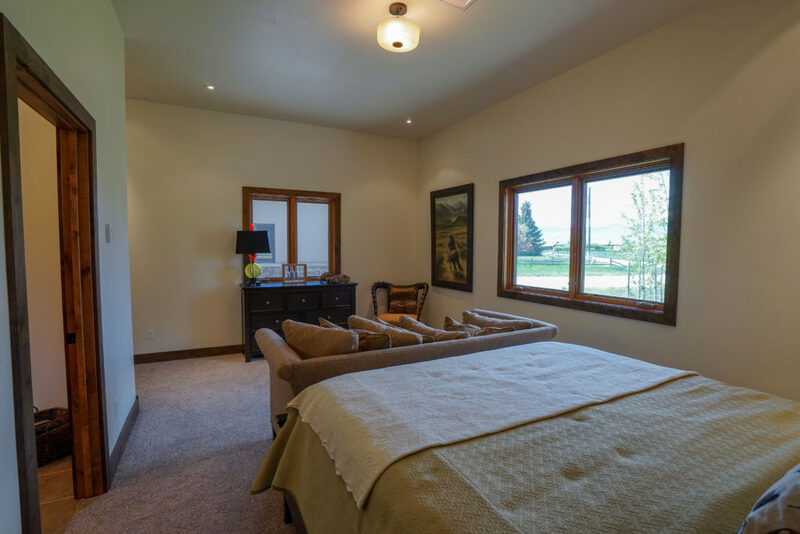 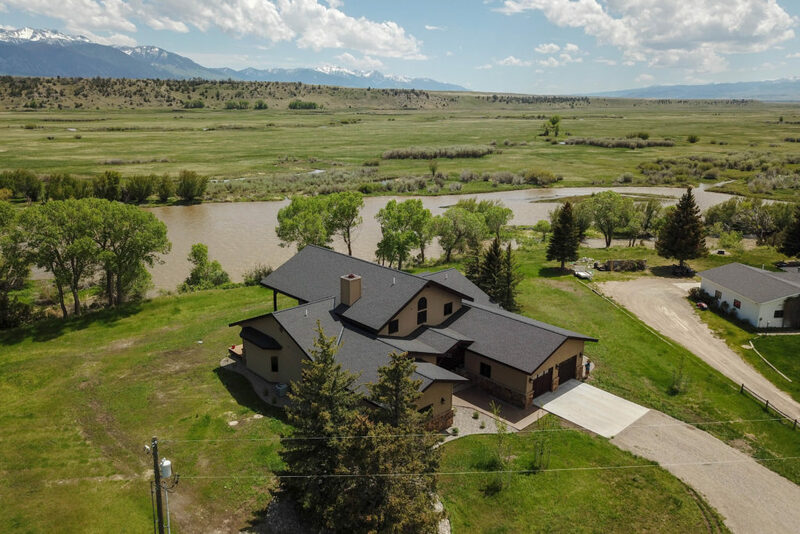 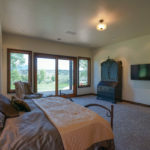 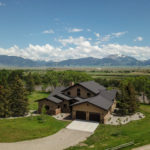 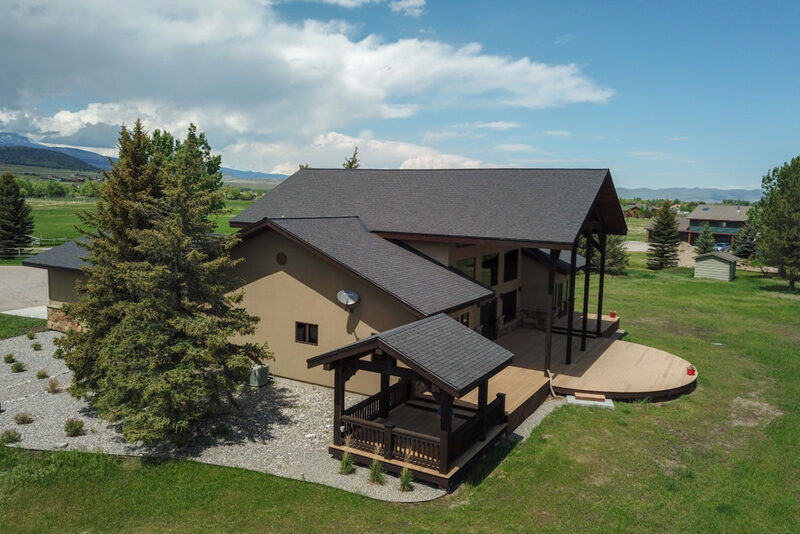 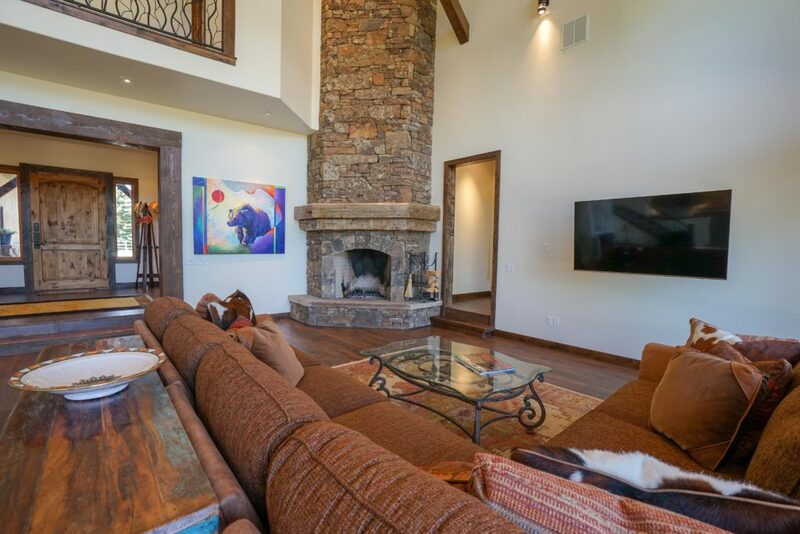 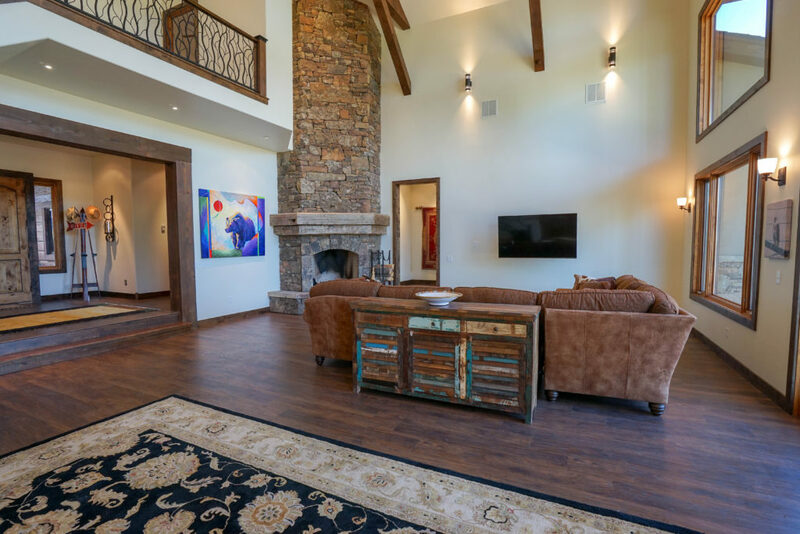 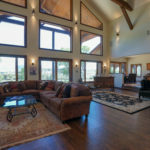 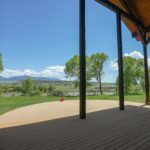 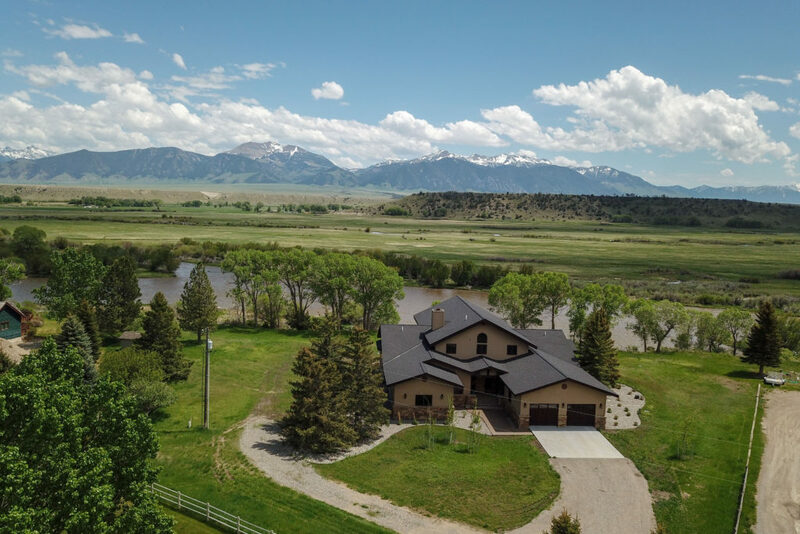 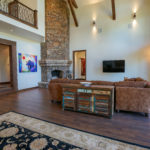 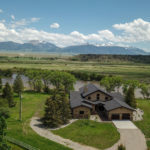 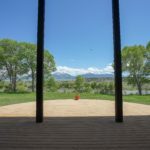 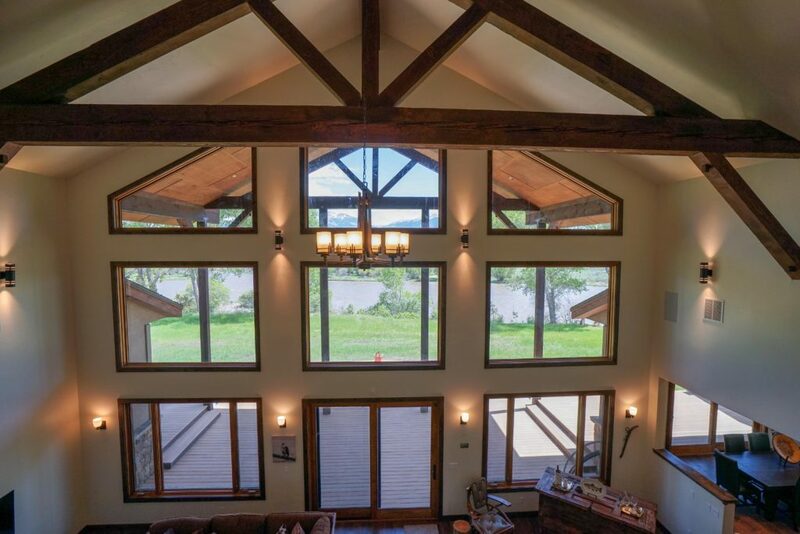 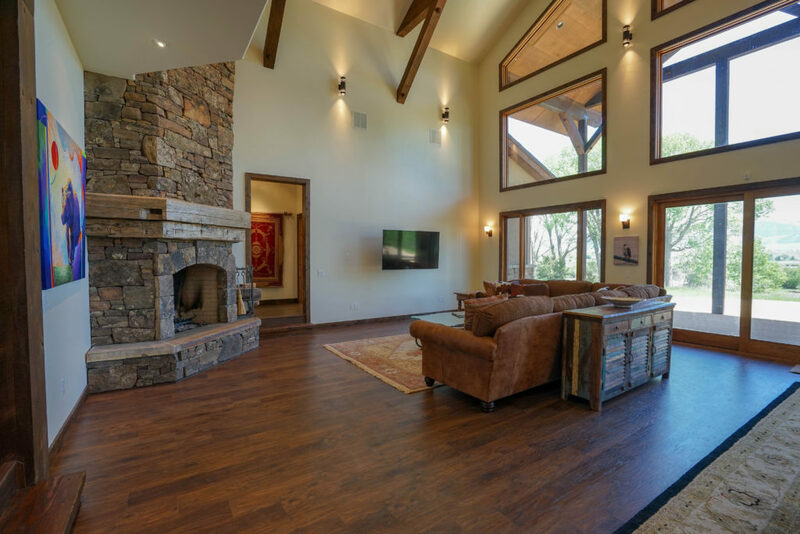 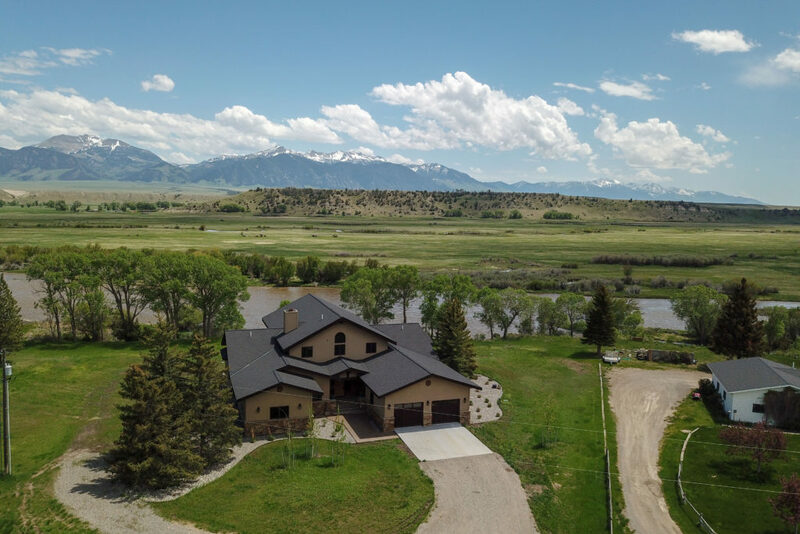 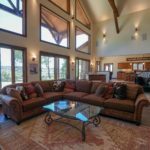 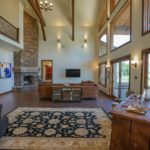 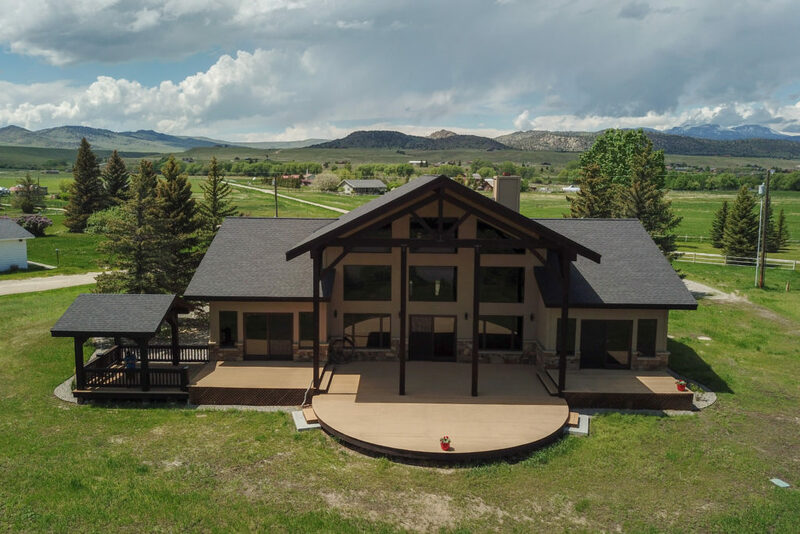 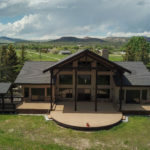 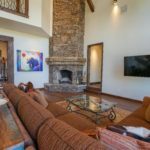 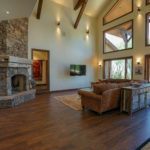 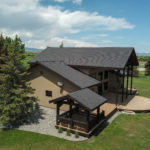 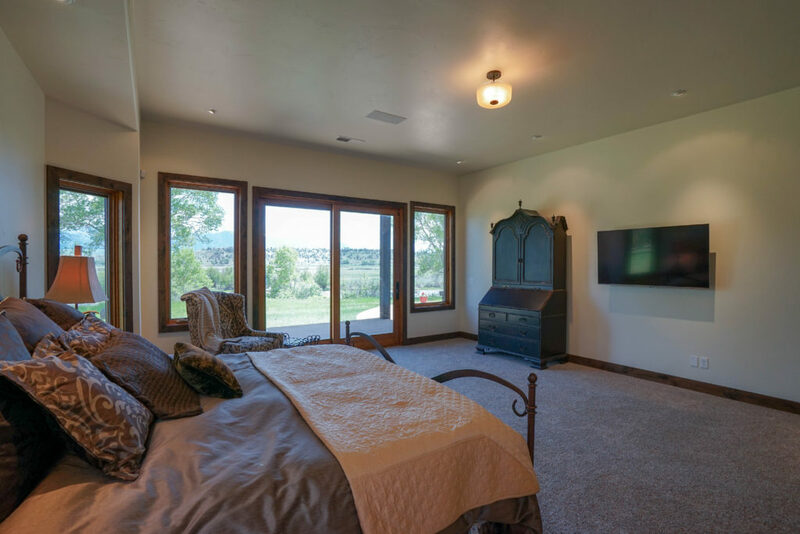 The comfortable living area has a beautiful rock fireplace, large flat screen TV with satellite service and stunning views of the Madison Range and river. 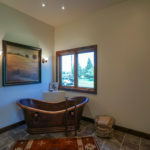 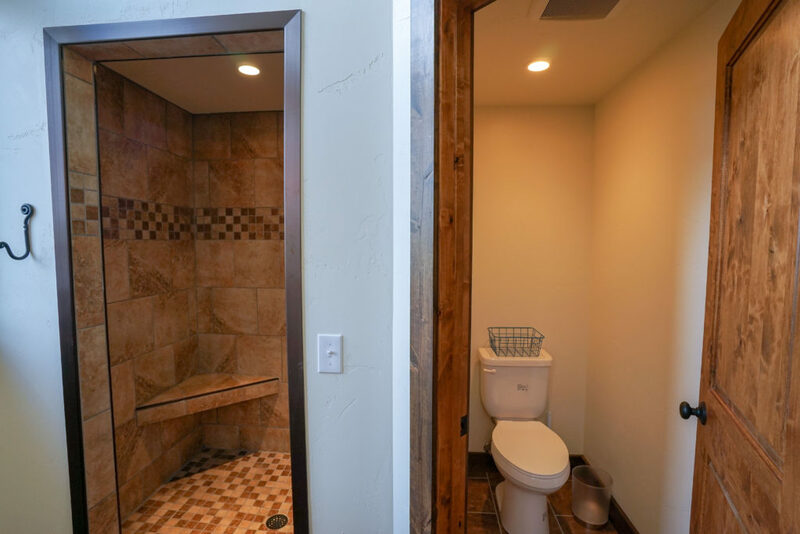 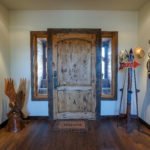 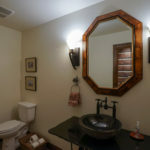 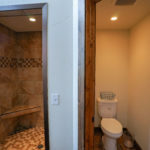 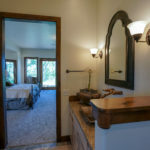 There is also a privacy corner, perfect for reading or visiting and a large antique bar, with outside access to the expansive deck and gas barbecue grill. 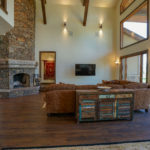 Ennis and surrounding areas are known for it’s great fishing. 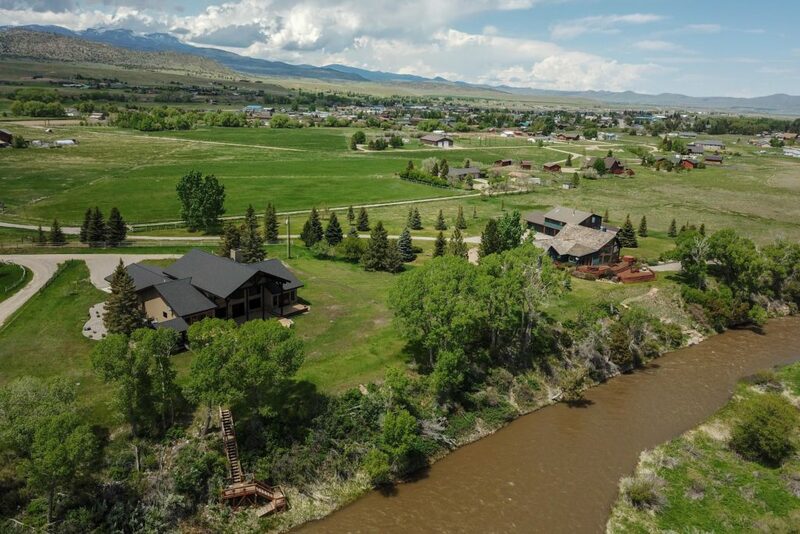 The famous Madison River runs right in front of the property. 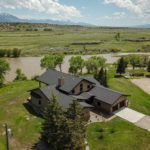 Other rivers in the area include the Jefferson, Ruby, Big Hole and Beaverhead. 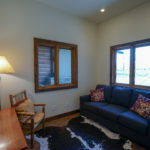 Yellowstone National Park is an easy hour and a half away. 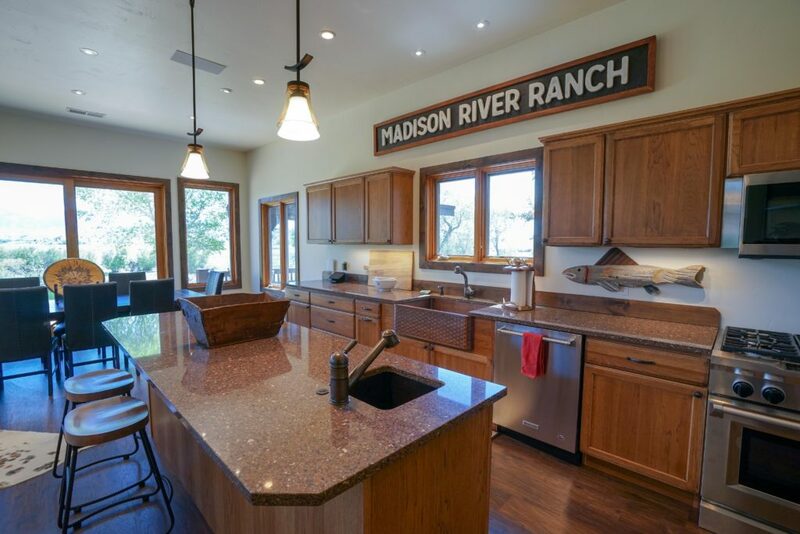 Lakes in the area include Ennis, Harrison, Cliff, Wade, Hebgen, Quake and Henry’s Lake. 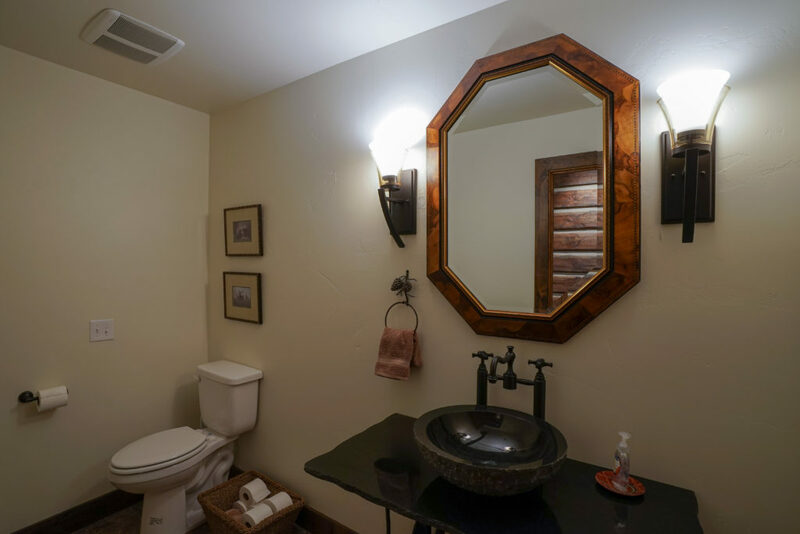 The historic town of Virginia City is an easy 15 minute drive. 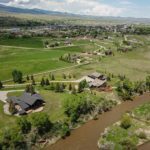 Other things to do in the area include hiking, mountain biking, kayaking, paddle boarding, hunting, golfing and Geo caching. 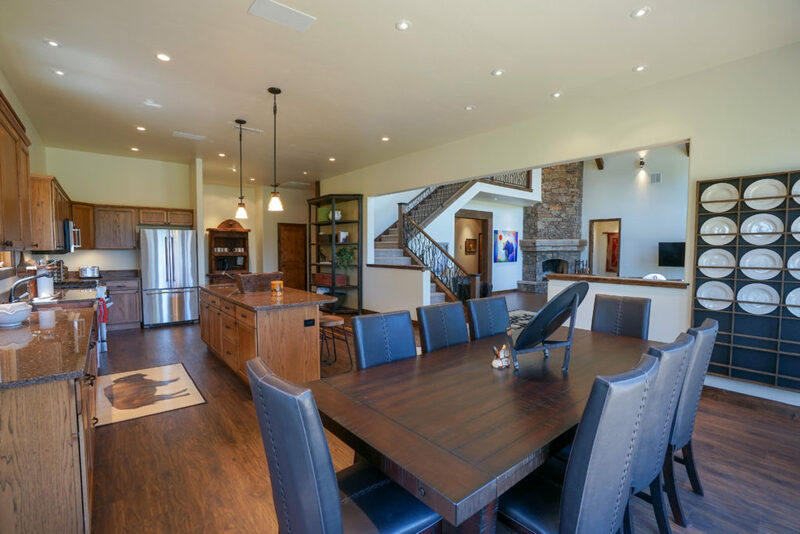 The town of Ennis has a great kids fishing pond at Lion’s Park, a golf course, new wonderful library and hospital. 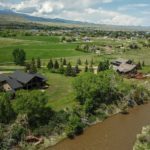 Local favorites include Willie’s Distillery, the Gravel Bar and the McAllister Inn, known for their giant burgers.